NEXT | Could a Cataclysm-style expansion work? You know, I’m pretty sure it was a really awkward family reunion, but this little tableau of elves made me terribly happy. It’s nice to know that despite their many differences, all of them will still come together to fight for a united cause. Granted, it’s a world-ending kind of cause, but hey, at least they’re trying to get along. What is the difference between shaman changing into ghost wolves and druids shape changing into wolves? If ghost forms don’t have rage or affects on the mind, then what is the difference between druids turning into wolves and turning into bears, which are also related to an angry ancient (Ursoc)? Shaman aren’t really turning into wolves, they’re just assuming a spirit form of the animal. The body changes, but the mind is still very much that of the Shaman. I’m assuming that the spirit wolves summoned for combat purposes are actual spirits of the animals, which is why they’re far more effective at fighting. You can auto-attack as a Shaman spirit wolf, but you can’t really use any of your abilities — it’s largely ineffective. So it’s not a literal shapeshift so much as just assuming a different form for a time. As for Ursoc, he’s definitely not an angry bear. Back in the days when Ursoc and his brother Ursol became Wild Gods, Ursoc was really, really protective — he saw preserving the wilds of Azeroth as his duty. That’s why bear form is also called the Guardian specialization — Ursoc guarded and protected the wilds, and he was really good at doing it. Both he and Ursol died in the War of the Ancients. The reason Ursoc is angry now isn’t because he’s innately that way. In Wrath, we saw Ursoc resurrected, but the furblogs used the magics of Vordrassil to do so — and that world tree was tainted by the Old Gods. In the Emerald Nightmare, he’s once again been touched by the Old Gods in the form of the Emerald Nightmare. Really, Goldrinn and Ursoc have very little in common, aside from both being Wild Gods. Q4tQ: Which is the greatest of the three mogu clans in Mogu’shan Palace, in your opinion? Gurthan, Harthak or Kargesh? Well technically speaking, you are, since you defeat all three of them. But if I had to make a choice between those three, I’d say probably Kargesh. I mean, the Gurthan just have fist weapons along with the Quilen, they’re doing extreme hand-to-hand combat. The Harthak use wind and lightning magic, but they’re nowhere near the skill or power of the Thunder King. The Kargesh, on the other hand, use giant weapons and fire magic on top of that. They seem to have more bases covered. 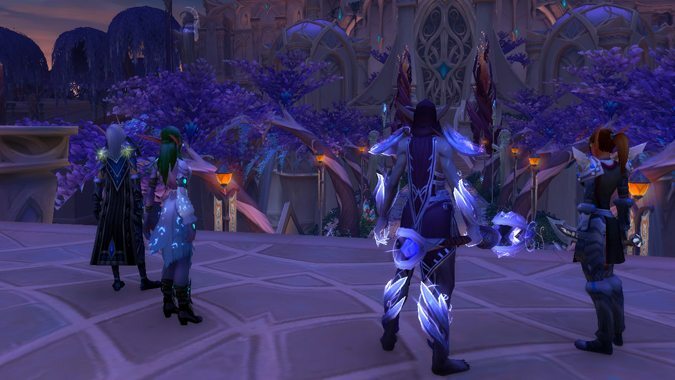 Q4tQ: Does anyone know offhand if that rogue-only mask you could get from the blood elf assassin in Azuremyst is A: Still Rogue Only, B: usable for transmog? I’m assuming you’re talking about the Blood Elf Bandit Mask — it’s actually not a Rogue-only mask at all. It’s not even a piece of armor really, it’s just a white item for the head slot. Which makes sense, since you can only find the thing in the Draenei starter zone, and they don’t actually have Rogues as a class option. As a white item, you can’t use it for transmog, but it shares the same model as Terokk’s Mask from a Sethekk Halls quest. So if you’ve got a leather wearing character that would like it for transmog purposes, all you have to do is complete the quest Terokk’s Legacy. Q4tQ: Based on the article about artifact power from yesterday, what would you think of the ability to “prestige” artifact weapons? Lower the cost a little, then after you fill a weapon, you get some kind of cosmetic reward, then reset the item to fill again for bigger and better rewards? On the one hand, that sounds kind of neat. On the other, it has the potential of being a never-ending grind, and players aren’t exactly thrilled with that idea. It forces the idea that if you want to keep being competitive, you have to keep playing, because if you stop you’ll fall behind. That’s not fun in the eyes of a lot of people. There’s something to be said about the satisfaction of completing something. For example, I have an obscene number of reputations that are fully maxed out, 999/1000 Exalted. Every expansion, I make it a point to do this. There are usually pretty good rewards at Exalted, and frankly, seeing all the tidy rows of full green bars is just inherently satisfying in a way that’s difficult to express. It’s that sense of completion — a big ‘the end’ to the grind. Like checking something off of a giant to-do list. Prestige anything removes that sense of satisfaction. There is no completion, there’s just an endless slog — and eventually, you’re going to get tired of the slog. If you’re chasing a golden ring, you want the satisfaction of eventually catching that golden ring. Because if you’re never, ever going to catch it, why should you even bother chasing it at all? Q4tQ: Which class halls offer the auto complete a world quest once a day? I know Mage and DK do but it seems my Shaman and Hunter don’t. So how many classes are blessed and how many screwed on the auto complete? I frankly don’t feel the Eagle Network is as great as I’d thought it’d be so I’d rather have the auto complete and my Shaman It’s so unremarkable I can’t even recall what it is. Death Knights, Demon Hunters, Mages, Paladins, Warlocks and Warriors all have that auto-complete option as a perk. It’s actually kind of funny, because those are all classes I don’t play — so I’ve never seen the perk in action. I mean as far as I’m concerned, it’s just one world quest a day, which isn’t exactly a gigantic advantage. I’d rather go out and complete the quests myself — except for maybe the PVP related ones. It’d be nice if I could auto-complete one of those a day, just for the purposes of Mark farming for transmog sets.